Patients and Methods: Between March 2012 and May 2017, 50 patients (14 neonates) underwent repair of coarctation of aorta through a thoracotomy. 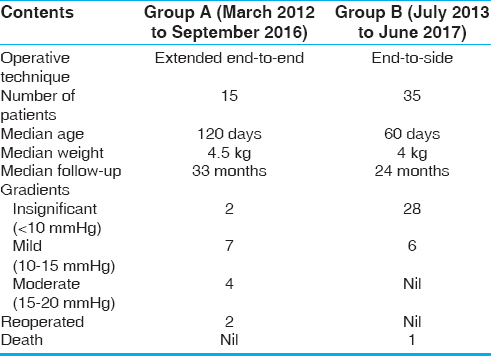 The age ranged from 6 days to 2 years (median 2 months) and the weight from 1.8 to 8.0 kg (median 4.3 kg). A total of 15 patients (Group A) underwent repair by the extended end-to-end anastomosis. Among them, two patients developed early restenosis at the proximal arch requiring surgical reintervention. Hence, in the second half of the study, 35 patients (Group B) who were identified to have significant hypoplasia of the proximal arch underwent a modified end-to-side anastomosis of the descending aorta to the proximal arch incorporating the distal ascending aorta in the anastomosis and leaving the left subclavian artery end of the isthmus as an end-on vessel. Results: One neonate in Group B died due to a cause not related to the repair. All the other patients in Group B are doing well without a residual gradient during a median follow-up of 23 months. There were no airway issues related to extensive mobilization of the aorta. Conclusion: End-to-side anastomosis of the descending aorta to the proximal arch and side of the ascending aorta is possible through a thoracotomy and can be achieved with good outcome in neonates and infants. In our own experience, we have addressed the repair of isolated coarctation of aorta with arch hypoplasia without an intracardiac defect entirely via thoracotomy. During the first half of our study (Group A), we performed an extended end-to-end anastomosis in the fashion described earlier., However, we noticed a significant recoarctation in two patients requiring early surgical reintervention. We realized that the cause of the recurrence was failure to address adequately the hypoplastic arch segment of the proximal arch between the base of the IA and LCC. This was due to the inability to reach adequately to the base of the IA during the anastomosis in this subset of patients. Hence, in the second half of our study (Group B), we modified our surgical strategy and used a modified technique of end-to-side anastomosis of the descending aorta to the proximal arch extending to the distal ascending aorta, leaving the LSA end of the isthmus as an end-on vessel. This modification is from the technique of end-to-side anastomosis that was described earlier., This strategy eliminated the recurrence of coarctation in neonates and infants operated in our unit for isolated coarctation with arch hypoplasia from lateral thoracotomy. We hereby present our experience with this modified end-to-side anastomosis. Between March 2012 and May 2017, 50 patients (14 neonates) underwent repair of isolated coarctation of aorta through a left posterolateral thoracotomy. The age ranged from 6 days to 2 years (median 2 months) and the weight from 1.8 kg to 8.0 kg (median 4.3 kg). In the first half of our study (Group A), 15 patients who had hypoplasia of the aortic arch underwent an extended end-to-end anastomosis of the descending aorta to the undersurface of the arch., We noticed a significant recoarctation in two patients requiring early surgical reintervention after 6 months. Hence, in the second half of our study, we modified our surgical strategy and redefined the hypoplasia of the aortic arch as mentioned earlier [Figure 1]. Taking this into consideration, 35 patients (Group B) were found to have significant hypoplasia of the proximal arch; 14 patients among them were neonates. The smallest neonate weighed 1.8 kg. Among the neonates, four had to be taken up for surgery on an emergent basis, with prostaglandin dependent circulation to the lower limbs from the ductus. Three of them were on ventilation preoperatively with minimum inotropic support. Thirty-five patients (Group B) in the second half of our study with proximal arch hypoplasia [Figure 1] underwent the modified end-to-side anastomosis as follows. Through a left posterolateral thoracotomy, the aorta, the coarctation segment, and the ductus arteriosus were dissected. Extensive mobilization of the arch, descending aorta, LSA, LCC, and the IA was done. By carefully retracting the arch during dissection, the IA dissection was continued into the ascending aorta until we reach the distal part of the ascending aorta. The pericardium is opened, and the ascending aorta is mobilized. The descending aorta was mobilized as low as possible taking care not to injure the intercostal arteries. The intercostal arteries are mobilized and temporarily occluded with medium-sized hemoclips causing only moderate occlusion to enable to be removed later carefully at the end of the repair. Mobilization of the aorta is essential to ensure a tension-free anastomosis and prevent bronchial compression. During this dissection, all patients were cooled to a core temperature of 34° C using surface cooling with a cooling blanket. 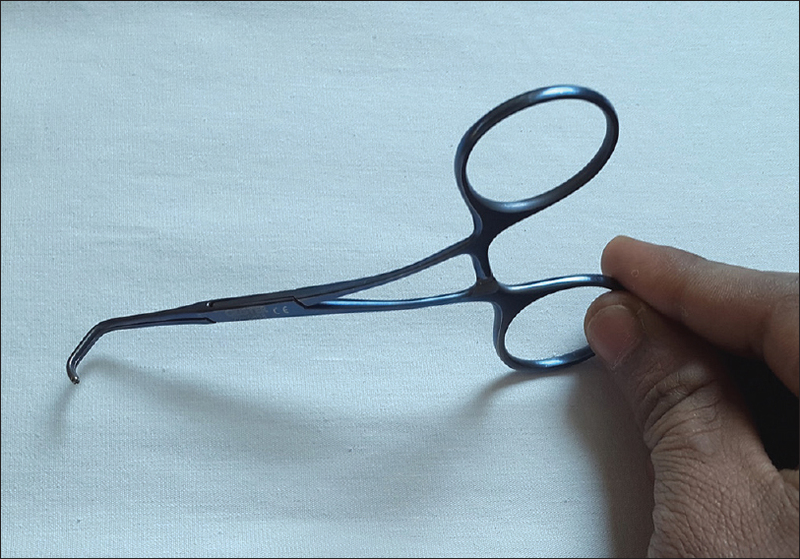 At the commencement of the actual procedure, the LSA and the LCC were separately occluded temporarily with elastic vessel loupe by carefully pulling them against the vessel with counter traction and applying a medium-sized hemoclip to the vessel loupe as close to the vessel as possible [Figure 2]. We feel that this maneuver will help to avoid space constraint using separate clamps. Following this, a short and small C-clamp was used to clamp separately, the base of the IA and the distal part of the ascending aorta (the innominate– ascending aorta junction) [Figure 2] and [Figure 3] to allow approximately 50%–60% of the blood flow to the brain during the repair [Figure 2]. This was carefully done monitoring the right radial artery pressure so that it is occluded partially and not clamped significantly. The C-clamp is applied carefully to occlude approximately 50% of the base of the IA and the distal ascending aorta. This is assessed by visual inspection of adequate pulsation of the IA after clamping and simultaneously coordinating with anesthesiologist to maintain a cerebral perfusion pressure of 35 mmHg. After this, the descending aorta was clamped with an angled cross-clamp and the ductus arteriosus ligated. The coarctation segment was excised in continuity with the ductus arteriosus and the isthmic end left as on end-on vessel with a stay suture of 7/0 polypropylene. The undersurface of the arch was incised proximal to the origin of the LSA. The incision was carried proximally across the base of the LCC and the IA to reach the distal ascending aorta [Figure 3]. A wide anastomosis was done between the descending aorta and the undersurface of the arch taking care to reach up to the distal ascending aorta using continuous 7/0 polypropylene. The anastomosis started at the junction of the ascending aorta/IA, and then proceeded toward the distal end of the incision. The other end of the suture is used to start the other half of the anastomosis by careful backhand strokes of the needle at the proximal part of the incision to incorporate the intima of the ascending aorta completely. Throughout the performance of the anastomosis, the proximal and distal clamps are held together by the second assistant standing on the right-hand side of the surgeon to stabilize the clamps so that the blood flow to the IA that is partially clamped is not compromised. 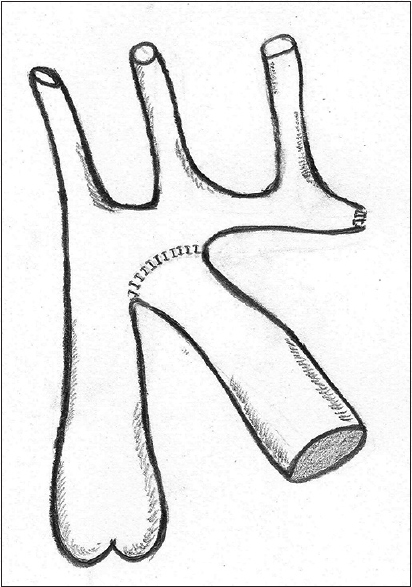 After completion of this anastomosis, the distal end of the divided isthmus was sutured separately with a running suture of 7/0 polypropylene leaving it as an end-on vessel [Figure 4]. The clamps were released to establish flow in the aorta. After this, using a fine angled mosquito, the temporarily occluding medium hemoclips were removed carefully by counter traction to establish flow to the neck vessels. 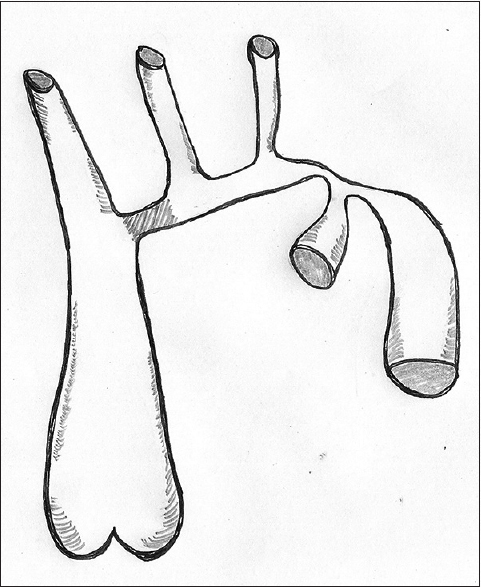 Figure 4: The completion of the end-to-side anastomosis of the descending aorta to the proximal arch incorporating the distal ascending aorta. The isthmic end of the arch has been sutured separately to leave it as an end-on vessel. Similarly, the hemoclips on the intercostal vessels were removed. As a routine, we have not closed the incised mediastinal pleura. All patients had arterial lines in both proximal (right radial artery) and distal (femoral artery) segments. In neonates, the umbilical line was used for monitoring the distal pressure. Both proximal and distal pressures in the aorta were monitored intraoperatively and postoperatively. During the anastomosis when the proximal C-clamp was applied partially to occlude the base of the IA, care was taken by the anesthesiologist to ensure cerebral protection by cooling the head with ice packs and maintaining the core temperature to around 34°C. Due to cost constraints, we have not been able to use cerebral blood flow monitoring such as NIRS in these patients. Milrinone was used at a dose of 0.5 mcg/kg/min in all the patients. Intravenous beta-blockers and sodium nitroprusside were used selectively to treat transient hypertension. Two-dimensional (2D) echocardiography was performed at the bedside in the Intensive Care Unit to assess the left ventricular function and the arch repair. Statistical analysis was performed using SPSS software version 16 (SPSS, Inc, Chicago, IL, USA). The sample size of two groups could only allow for the application of Chi-square test comparing gradient in the repaired segment. Odds ratio (OR) with 95% confidence interval (CI) was calculated for two groups. Survival analysis was performed using Kaplan–Meier method. The median follow-up was 33 months in Group A and 24 months in Group B (range 2 months to 62 months). In the immediate postoperative period, residual coarctation was assessed clinically in all the patients in the ICU with the help of right radial and femoral arterial lines. Later during follow up, evaluation of the aortic arch was done by 2D echocardiography. This was done before discharge and later at regular intervals. The first follow-up evaluation was done at 1 month after discharge and later at 3 monthly intervals. During evaluation, a gradient of <10 mmHg on 2D CW Doppler was considered insignificant (nil to 10 mmHg). A gradient between 10 and 15 mmHg was considered as mild and a gradient of 15–20 mmHg was considered as moderate [Table 1]. 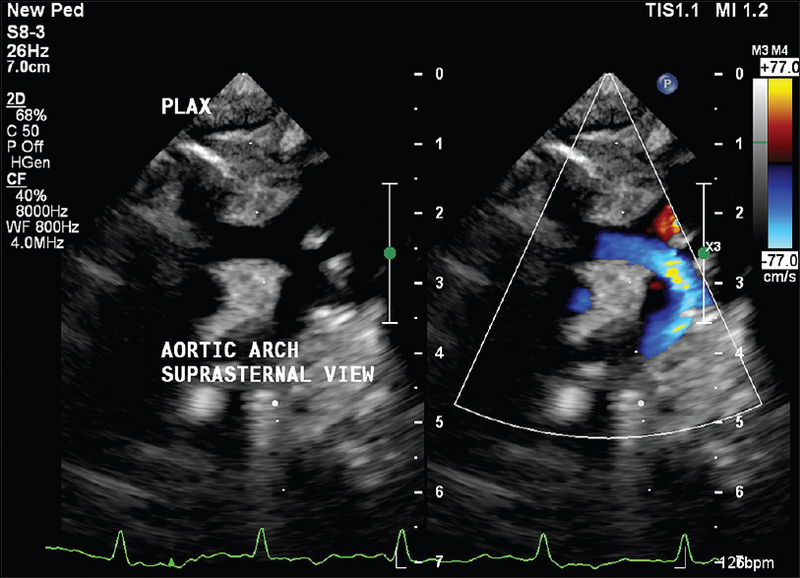 The aortic arch was assessed by the suprasternal view during 2D echocardiography. One neonate in Group B died early due to a cause not related to the coarctation repair. the baby was on ventilator preoperatively with renal failure and severe coarctation associated with biventricular dysfunction. The baby died on the 6th postoperative day due to a persistent renal failure associated with systemic sepsis. In Group A, two patients developed severe recoarctation very early after discharge requiring early surgical reintervention within 6 months after surgery. Both of them underwent arch repair from midline on CPB. The median cross-clamp time was 25 min in Group B and 20 min in Group A. In all the babies in Group B, there were no neurological complications such as seizures encountered due to partial clamping of the IA during the anastomosis. Similarly, following extensive dissection, mobilization, and end-to-side anastomosis of the descending aorta to the distal ascending aorta and IA, none of the patients developed symptoms related to string phenomenon/left bronchial compression or airway issues. All of them had smooth extubation in the postoperative period. In addition, we did not encounter any incidence of chylous effusions/lymphatic leaks, phrenic nerve palsy, and evidence of sympathetic chain damage or damage to vasa vasorum. In Group A, the gradients were insignificant in two, mild in seven, and moderate in four patients. In Group B, the gradients were insignificant in 28 and mild in six patients [Table 1]. The aortic arch in Group B patients as assessed by 2D echo was unobstructed [Figure 5]. 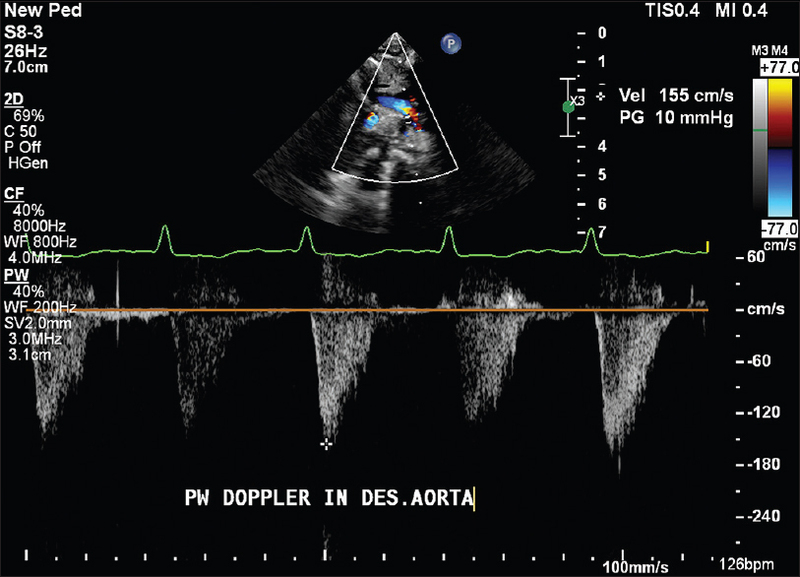 Pulsed wave (PW) Doppler in the descending aorta also showed an insignificant or minimal gradient [Figure 6]. [Figure 7] shows a preoperative computed tomogram (CT) angiography of a 1-month-old sick neonate in Group B on ventilator that delineates the severe coarctation of the aorta that could not be diagnosed by 2D echocardiography. This neonate had a good repair that is shown in the 2D echo and PW Doppler images of [Figure 5] and [Figure 6]. 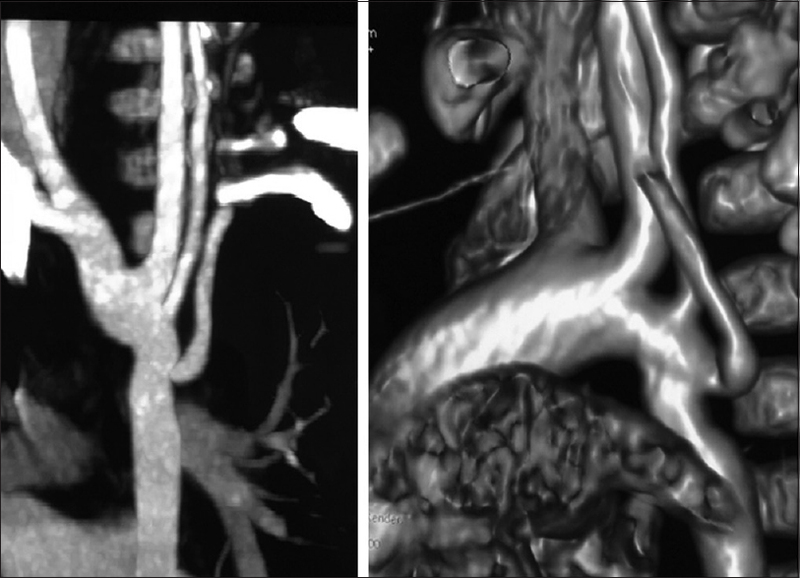 CT angiogram was selectively done in one patient from Group B during follow-up after 1 year. This neonate was 1.8 kg when he was operated. He did very well later on and gained a weight of 7.8 kg at 1 year. [Figure 8] shows the CT angiogram of this patient that reveals unobstructed arch without gradient and with a smooth curve of the descending aorta from the arch. The gradient during follow-up in the two groups showed more number of patients with higher gradient in the Group A as compared to Group B (P = 0.000). 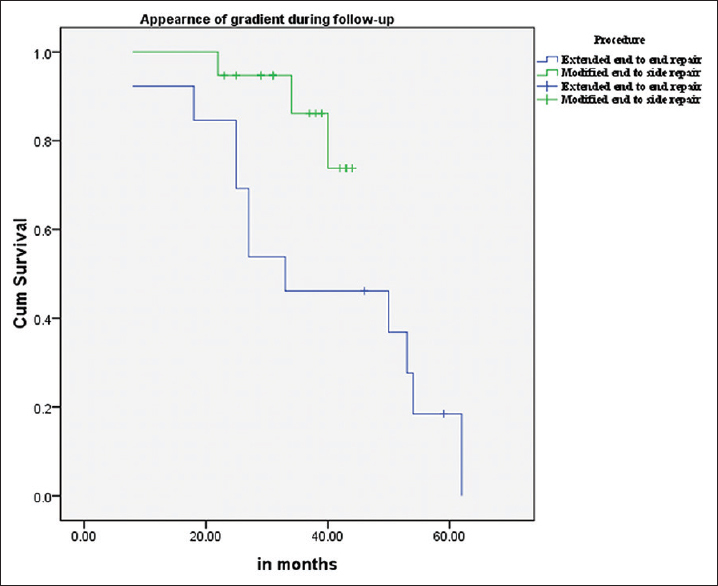 There is a higher risk of appearance of gradient during follow-up if an extended end-to-end anastomosis (Group A) was performed (OR = 5.359:95% CI 1.849–15.530 [Figure 9]. Kaplan–Meier curve analysis was used to show the freedom from reintervention in the Group B patients where the modified end-to-side anastomosis was used [Figure 10]. In proximal arch hypoplasia, the segment between the IA and the LCC is difficult to approach surgically in the classical extended end-to-end anastomosis., There is a difference of opinion among many centers on the strategy to deal with this part of the hypoplasia of the arch. Some centers have addressed this problem completely from the midline on CPB., These studies claim good long-term outcome without reoperation. However, repair of the coarctation associated with proximal arch hypoplasia from midline would require CPB and this would subject the neonate or infant to the deleterious effects of the CPB. This would be more exaggerated if the neonate is sick with preoperative metabolic acidosis. In this setting, we feel that avoiding CPB is a very good surgical strategy and this would definitely help in reducing the postoperative morbidity in an already sick neonate. In the modification of the technique of end-to-side repair that we employed in Group B patients, the descending aorta is connected to the proximal aortic arch and the distal ascending aorta. This completely isolates the hypoplastic distal arch and encroaching ductal tissue from the anastomotic site. This technique would be effective in preventing recurrent obstruction, even after repair in neonates. After this modification, we noticed a distinct difference in the outcome of our patients with no evidence of any gradients in all the patients of Group B in the follow-up period [Figure 9] and [Figure 10]. 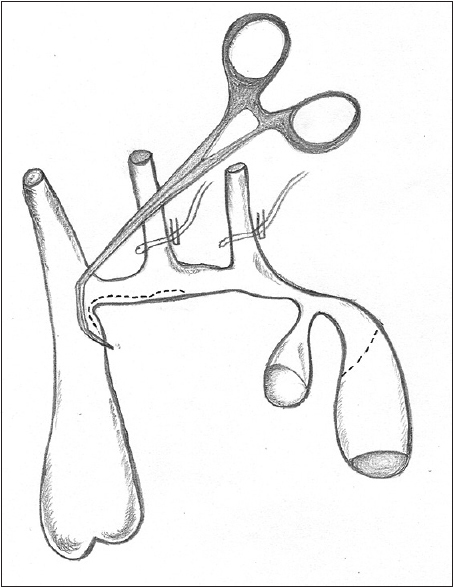 By leaving the subclavian end of the isthmus as on an end-on vessel, the distal part of the arch is eliminated from the anastomosis unlike the extended end-to-end where it is incorporated. The elimination of the distal part of the arch will enable the descending aorta to approximate directly to the proximal part of the arch giving an unobstructed flow in the arch. In this technique extensive mobilization of the descending aorta has to be done to reach the distal part of the ascending aorta without tension. We did not divide the intercostal vessels to enable this as reported earlier. However, in our experience, we did not encounter any compression on the left bronchus when the descending aorta is brought so high enough to reach the proximal segment. On the other hand, we feel that in neonates and infants, the dissection of the entire arch and ascending aorta is very easily performed without difficulty by staying close to the artery so that damage to the neighboring structures is avoided. Recurrent coarctation is a difficult problem to handle, and every effort should be made to prevent recurrence. Many studies have shown good intermediate and long-term results of freedom from recurrence.,,, By addressing the repair entirely via thoracotomy, the growth of the proximal arch has been shown to be satisfactory with low risk of intervention during follow-up., Similarly, our report is purely focused on repair of coarctation via thoracotomy and emphasizes the surgical technique of end-to-side anastomosis in this setting. We have reported the elimination of recurrence of coarctation using this technique in the short follow-up period in this small group of patients. However, a larger volume of patients and long-term follow-up is required to prove the usefulness of this technique. Our early experience with this technique shows promising and good outcome with no recurrence of coarctation and with a mild and insignificant gradient in all the Group B patients. However, long-term follow-up is required to reveal the superiority of this technique through thoracotomy. In isolated coarctation of aorta associated with hypoplasia of the entire arch in neonates and infants, it is possible to do surgical repair completely from the left lateral thoracotomy. The surgical approach has to be tailored depending on the anatomy of the arch. In case of hypoplasia of the distal arch with normal caliber of the proximal arch, an extended end-to-end anastomosis would be sufficient. If there is proximal arch hypoplasia associated with hypoplasia of the distal arch, the modified end-to-side anastomosis of the descending aorta to the proximal arch incorporating the distal part of the descending aorta would prevent recoarctation. Early experience with this technique seems to be encouraging but long-term follow-up is required to reveal the efficacy. Mr. Mudivarti Nikhil from Hyderabad for his artistic contribution to the figures. 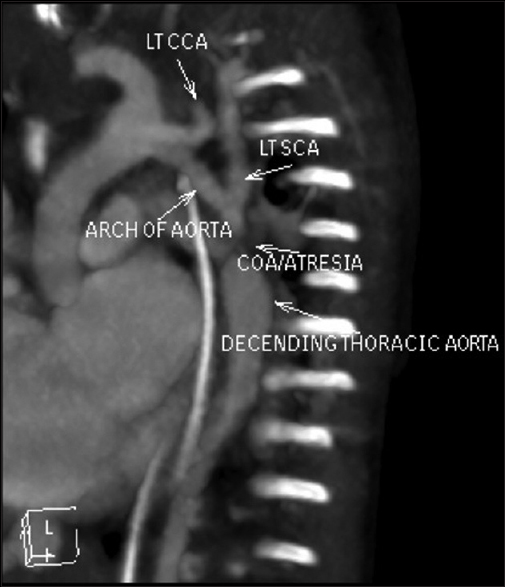 Craaford C, Nylin G. Congenital coarctation of aorta and its surgical treatment. J Thorac Surg 1945;14:347-61. Gross RE. Surgical correction for coarctation of the aorta. Surgery 1945;18:673-8. Elliott MJ. Coarctation of the aorta with arch hypoplasia: Improvements on a new technique. Ann Thorac Surg 1987;44:321-3. Ungerleider RM, Pasquali SK, Welke KF, Wallace AS, Ootaki Y, Quartermain MD, et al. Contemporary patterns of surgery and outcomes for aortic coarctation: An analysis of the Society of Thoracic Surgeons Congenital Heart Surgery Database. J Thorac Cardiovasc Surg 2013;145:150-7. Kotani Y, Anggriawan S, Chetan D, Zhao L, Liyanage N, Saedi A, et al. Fate of the hypoplastic proximal aortic arch in infants undergoing repair for coarctation of the aorta through a left thoracotomy. Ann Thorac Surg 2014;98:1386-93. Rakhra SS, Lee M, Iyengar AJ, Wheaton GR, Grigg L, Konstantinov IE, et al. Poor outcomes after surgery for coarctation repair with hypoplastic arch warrants more extensive initial surgery and close long-term follow-up. Interact Cardiovasc Thorac Surg 2013;16:31-6. Wright GE, Nowak CA, Goldberg CS, Ohye RG, Bove EL, Rocchini AP, et al. Extended resection and end-to-end anastomosis for aortic coarctation in infants: Results of a tailored surgical approach. Ann Thorac Surg 2005;80:1453-9. Rajasinghe HA, Reddy VM, van Son JA, Black MD, McElhinney DB, Brook MM, et al. Coarctation repair using end-to-side anastomosis of descending aorta to proximal aortic arch. Ann Thorac Surg 1996;61:840-4. Elgamal MA, McKenzie ED, Fraser CD Jr. Aortic arch advancement: The optimal one-stage approach for surgical management of neonatal coarctation with arch hypoplasia. Ann Thorac Surg 2002;73:1267-72. Younoszai AK, Reddy VM, Hanley FL, Brook MM. Intermediate term follow-up of the end-to-side aortic anastomosis for coarctation of the aorta. Ann Thorac Surg 2002;74:1631-4. Lee MG, Brink J, Galati JC, Rakhra SS, Konstantinov IE, Cheung MM, et al. End-to-side repair for aortic arch lesions offers excellent chances to reach adulthood without reoperation. Ann Thorac Surg 2014;98:1405-11. Tsang V, Kaushal S. Coarctation aortoplasty: Repair for coarctation for arch hypoplasia with resection and extended end to end anastomosis. Oper Tech Thorac Cardiovasc Surg 2005;10:200-8. Wood AE, Javadpour H, Duff D, Oslizlok P, Walsh K. Is extended arch aortoplasty the operation of choice for infant aortic coarctation? Results of 15 years' experience in 181 patients. Ann Thorac Surg 2004;77:1353-7. Kaushal S, Backer CL, Patel JN, Patel SK, Walker BL, Weigel TJ, et al. Coarctation of the aorta: Midterm outcomes of resection with extended end-to-end anastomosis. Ann Thorac Surg 2009;88:1932-8.